What is a Taxi Fare Flag Drop Rate? There was a time when taxi meters had flags the driver would manually rotate to the side once a passenger entered the vehicle. It automatically added a surcharge price amount on the meter which is called the flag drop fee. Some old meters had noisy clicking sounds. The reason for the flag drop is short rides. A good example is someone who walks to their neighborhood grocery store and then calls a cab for a ride back home. If they live 4 or 5 blocks away the fare might only be 2 or 3 dollars. It wouldn't be cost efficient. It cost the taxi driver money to travel to the pick-up zone, then to the drop-off. Without a flag drop fee the taxi would lose money. Our taxi cabs average 7-10 grocery store pick-ups a week. Most trips average under 2 miles. ...and we're OK with that. It's part of the taxi business. 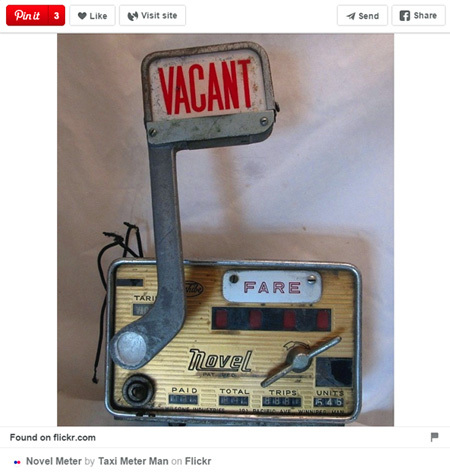 Although the days of the old design of taximeters are more than likely collectors items I would have to think somewhere there are still some taxicabs using them for the sake of nostalgia. Nowadays they're more technologically advanced. Some have GPS built in. In smaller cities some taxicabs don't even use meters. They go strictly by the mileage on the odometer. It's all the same price, but with the taximeter the customer can actually see the price and mileage as it changes.